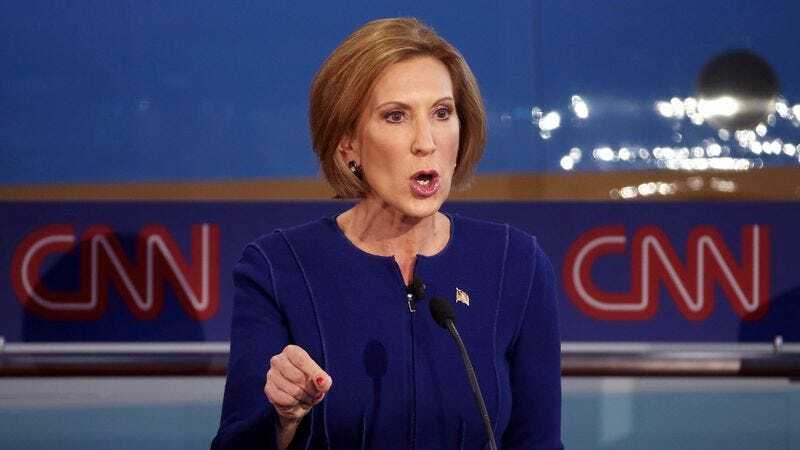 WASHINGTON—Saying she had proven herself to be a formidable contender worthy of respect, GOP leaders announced Thursday that Carly Fiorina had been officially promoted to a male candidate after her strong showing in last night’s primary debate. “Given her steady rise in the polls and her consistent performance on the national stage, we have determined that Ms. Fiorina’s skills as a speaker and compelling ideas about foreign and domestic policy merit her recognition as male,” said Republican National Committee chairman Reince Priebus, adding that the former Hewlett-Packard CEO had impressed GOP officials with her breadth of knowledge, her confidence, and her ability to doggedly attack both Democrats and her primary opponents, and therefore deserved to have the label of “female” removed entirely. “We are pleased to be able to offer Ms. Fiorina the increased respect and media coverage that come with being a male candidate. Allow me to be the first to congratulate him and say that he has certainly earned it.” Priebus added that the committee was still reviewing Marco Rubio’s performance, but was strongly considering promoting him to white.